Immigration Affidavit Forms are legally binding contracts in which a family member sponsor signs a sworn affidavit to provide financial support to a proposed immigrant. Immigration Affidavit Forms are called an Affidavit of Support in the United States. Affidavit of Support Form I-864 and Affidavit of Support Form I-134 are two examples of Support Affidavits. The United States Citizenship and Immigration Service requires documentation that an immigrant has adequate financial support while in the US. An Immigration Affidavit of Support creates a binding contract between the immigrant, sponsor and the US Government. The requirements of an Immigration Affidavit of Support state that the sponsored immigrant or the US Government can sue the sponsor if the sponsor fails to provide adequate support to the immigrant. An Immigration Affidavit is used to make sure the proposed immigrant can support himself or herself and does not depend on any US Government Welfare Programs. Immigration Affidavits are required for all immigrants applying for entry into the United States. An Immigration Affidavit of Support can only be terminated once the sponsored immigrant becomes a naturalized US citizen or is employed for the minimum amount of qualifying quarters of work as defined by the Social Security Act. 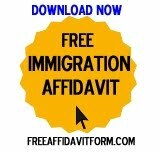 Download free Immigration Affidavit forms customized with your personal legal information.